High Resolution Hand-held Thermal imager / Fast Frame 15 IPS / Image Capture / Temperature Measurement / Rechargeable Battery. 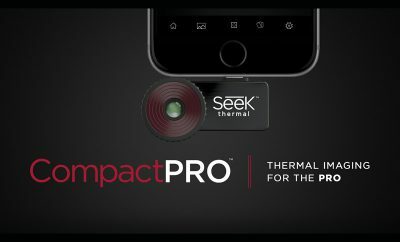 The Seek Reveal PRO Thermal Camera offers 76,800 pixels of infrared data, or four times more than any other stand-alone infrared camera under $4000. Monitoring Ground Temperature and any other applications where good night time or temperature measurement is required. When you need a thermal camera, you want to know about patterns of heat and temperature. The better the resolution of the infrared detector, the more information it will gather from your environment. 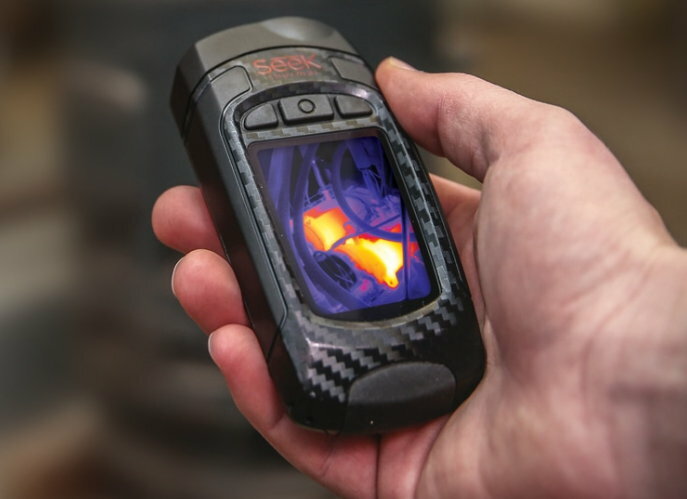 With a resolution of 320 x 240 pixels, the Seek Reveal PRO offers more of the real thermal data you’re looking for. And with a sensitivity of 0.07 °C, you can see the fine temperature gradients that indicate patterns of overheating or failure. The Reveal PRO thermal camera can view and measure temperatures from -40 to 626 °F (-40 to 330 °C), covering applications from search and rescue, to moisture intrusion, to overheating bearings. The Seek Reveal PRO uses a 32-degree lens to give the right balance between a medium and wide angle view. The lens feels just right for most applications, whether inside or out. With the higher resolution of the Reveal PRO, a digital zoom function allows you to enlarge a target without sacrificing picture detail beyond usefulness. We find that the fixed focus lens combined with a surprisingly fast startup (under 3 seconds) makes the Seek PRO ready whenever it’s needed. The bright, full-color display of the Reveal PRO camera is built using rugged Corning Gorilla Glass to offer the same protection as the rubberized exterior housing. The display can be viewed in 9 different color palettes: White hot, Black hot, Spectra (rainbow), Prism (rainbow HC), Tyrian, Iron, Amber, Hi (highlights only highest temps), and Hi/Lo (highlights highest and lowest temps). 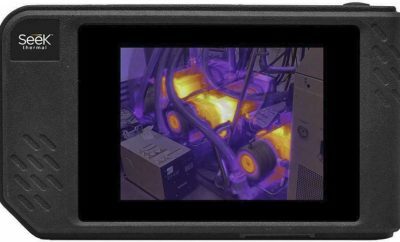 The Reveal PRO thermal camera also includes features usually only seen on higher end cameras. Adjustable level and span give the option of adjusting the contrast settings to better highlight specific temperatures of concern. And in order to account for how different materials emit and reflect infrared, the Seek Reveal PRO includes four preset emissivity settings: Matte (e=0.97), Semi-Matte (e=0.80), Semi-Glossy (e=0.60) and Glossy (e=0.30). Images are captured and stored to a 4GB internal flash drive, which holds over 4000 pictures. Images can be downloaded through the included USB-micro cable, which also provides the connection to recharge the Reveal PRO. An internal lithium-ion battery lasts a full four hours when running in Normal mode, and provides weeks of standby ability. Menu navigation is through a simple three-button interface and can be accomplished even while wearing gloves. 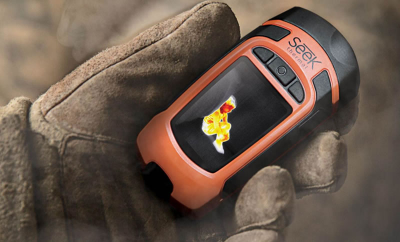 A single button on the right side of the Seek Reveal PRO activates an intense 300-lumen LED flashlight, giving the ability to see night or day, with visible or infrared light.